Due to family commitments I am not teaching at Impact Framing anymore. However I am open to scheduling workshop times for 3 or more students in my home. Please contact me at lorisartcards@yahoo.ca so we can arrange dates and times. 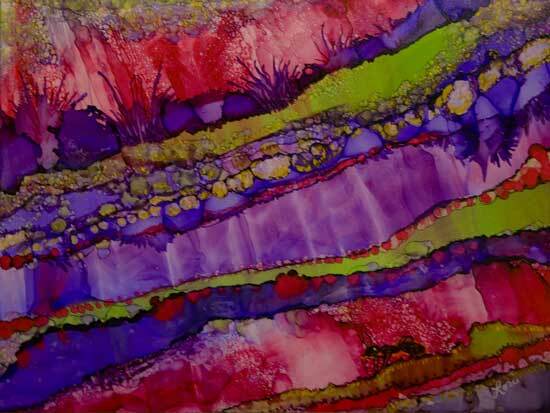 You will learn the basics of working with Alcohol Ink on glossy paper, Yupo paper and on ceramic. Contact me if you are interested in this workshop, I am currently taking names. Date to be announced. If you have never used acrylic paints and would like to gain a basic knowledge of the medium this workshop is for you. A brief history of acrylics will be presented. You will learn about supports, brushes, paints and mediums while completing various experiments on canvas boards. You will also begin a composition on a 10" x 14" canvas board.